Been away from this place for way too long, and getting some new posts written for the very near future. In the meantime - just wanted to give my book some shameless self-promotion! 'How To Be A Money Smart Student' is full of great money saving tips for students who have recently moved out on their own. It will also be a very valuable tool for that high school senior who is just finishing up and preparing for that next step out in the real world. 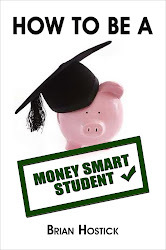 Just following a few of the tips and tricks in the book will save students hundreds, if not thousands, of dollars throughout the course of their post-secondary education. NOW would be a great time to order the book from Amazon so you have it in plenty of time to put it in their Christmas stockings!! Just click on the book cover below for instant access to the book on Amazon.com.